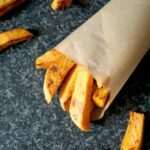 Learn how to make crispy baked sweet potato fries that are not only super delicious, but also healthy. A great side side or just a nutritious snack whenever hunger strikes. Low in calories and fat, these fries are just amazing. Sweet potatoes seem to be everybody’s favourite over the good old white potatoes. At least, when it comes about healthier choices. Now, let’s get it straight right from the beginning, I ABSOLUTELY LOVE WHITE POTATOES. And they can be healthy too, unless you drench them in oil that’s been used over and over again. You can bake the regular potatoes too, the same way I baked these sweet potatoes. Or maybe make some heavenly Homemade Spicy Potato Wedges. When you bake, a small amount of oil is needed, rather than a whole litre to deep fry. 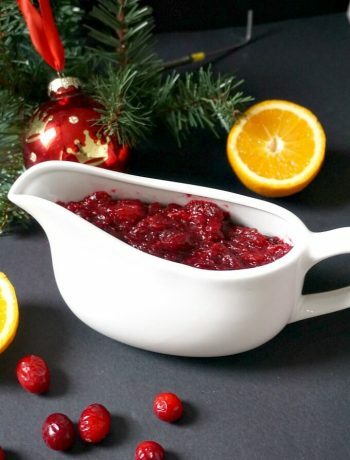 So, everybody wins, no need to waste oil, and you know you had a well nicer side dish. 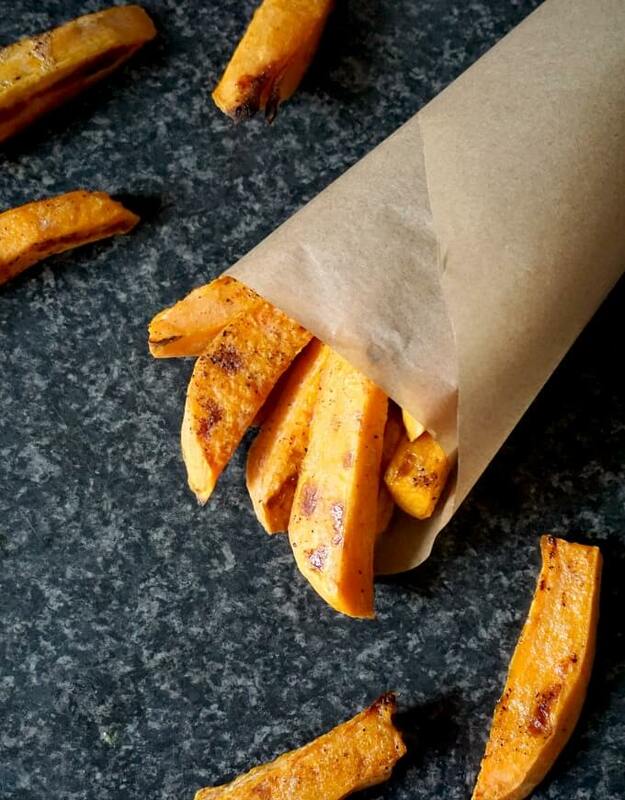 So, what it is the secret to PERFECTLY BAKED SWEET POTATOES FRIES? Well, first of all, don’t expect the same crispiness you would get from the regular potatoes. They have different texture, so, no matter what, you can never get them as crispy. And if someone says otherwise, well, they are lying. Still, there are a few tricks to get some decently crispy baked sweet potatoes. And there is no need for corn starch, no flour, no egg white, etc. 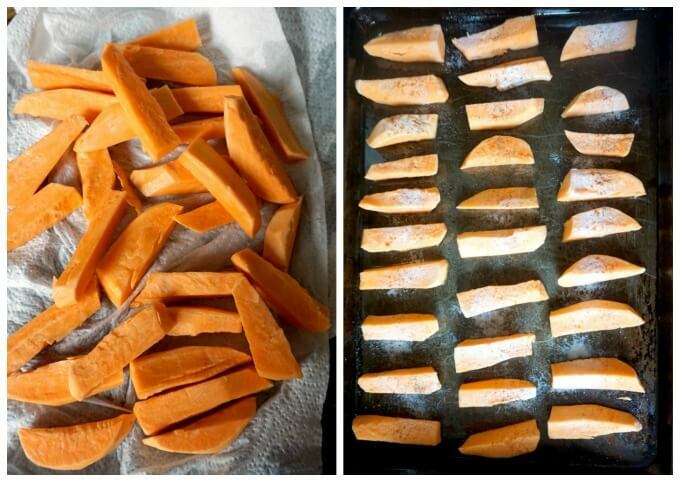 Firstly, sweet potatoes can be tricky to peel, so use a good vegetable peeler, it makes life a lot easier. Then, cut the potatoes a bit chunkier than regular fries. I would recommend you soak the potato chunks in cold water for at least one-two hours before baking, so that some of the starch can be released. Too much starch makes the sweet potatoes soggy, and before you add them to the baking tray, pat them dry with kitchen paper. Make sure the oven is hot before popping them in, a higher temperature helps get them crispy, I recommend baking them at 220 degrees Celsius (430 degrees Fahrenheit). Also, leave some space between them in the tray, if they are too close together, the steam will soften them. It is better to work in batches and bake twice, rather than attempting to bake too many at the same time. Cooking oil spray is great, but if you don’t have, use regular vegetable oil that has a high smoking point, I prefer sunflower oil, but it’s up to you. 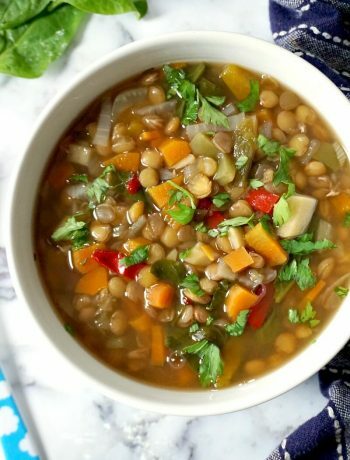 Healthy, delicious, and great for kids too. 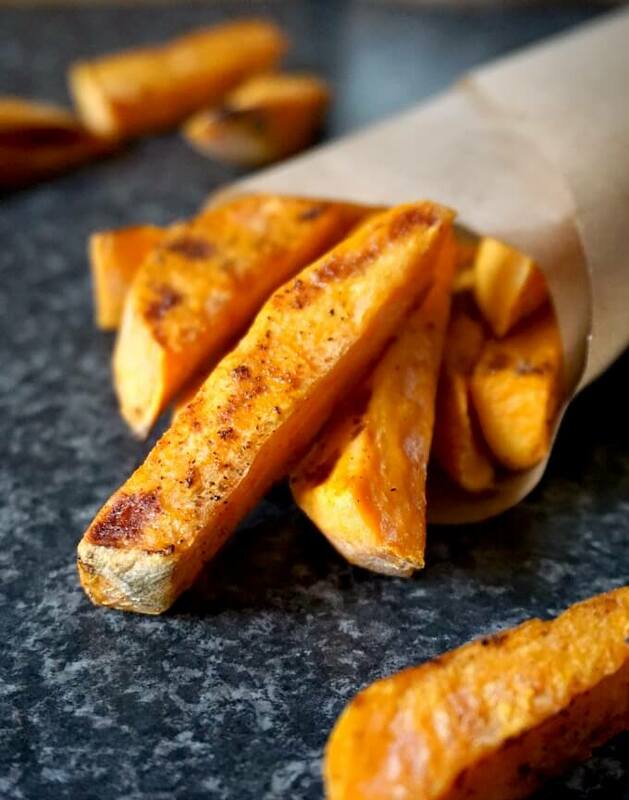 If you’ve tried my CRISPY BAKED SWEET POTATO FRIES or any other recipe on the blog then don’t forget to rate the recipe and let me know how you got on in the comments below, I love hearing from you! You can also FOLLOW ME on FACEBOOK, and PINTEREST to see more delicious food and what I’m getting up to. Learn how to make crispy baked sweet potato fries that are not only super delicious, but also healthy. 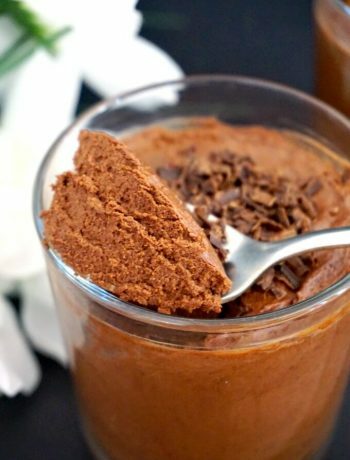 A great side side or just a nutritious snack whenever hunger strikes. Peel and cut the sweet potatoes into chunkier fries, then soak in cold water for about one or two hours, then drain the water and pat them dry using kitchen paper. Preheat the oven to 220 degrees Celsius (430 Fahrenheit). Sprinkle the sweet potatoes with salt and paprika. Drizzle the oil onto a baking tray, and pop it in the oven for 2-3 minutes, until the oil becomes hot. Arrange the sweet potatoes on the tray, leaving some space between them, if necessary, work in batches to avoid overcrowding. Spray the potatoes with oil spray, or use some more regular oil, then bake in the oven for about 20-25 minutes, turning them on the other side half the way through. Depending on your oven they might need to be in the oven or less or longer time, so do check them after 20 minutes. I wonder how would they taste with some chilly peri-peri sauce? Lovely recipe. Absolutely, they will taste very nice, worth a try!